Anybody who wants to make truly authentic Ashkenazi Jewish cuisine must first learn how to make schmaltz and gribenes. 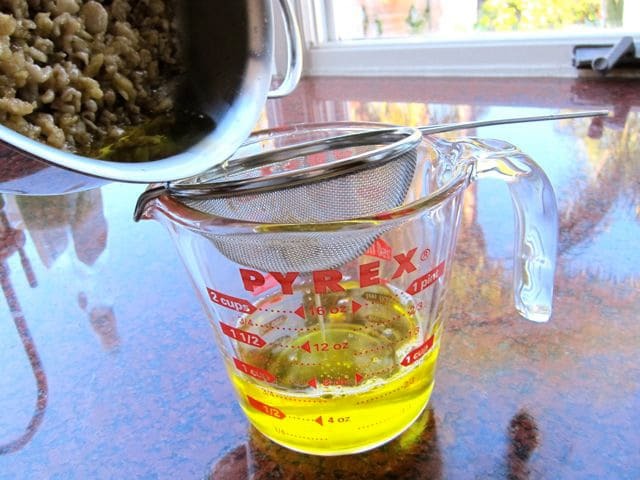 Schmaltz is rendered chicken fat, which is an important component of many traditional recipes. 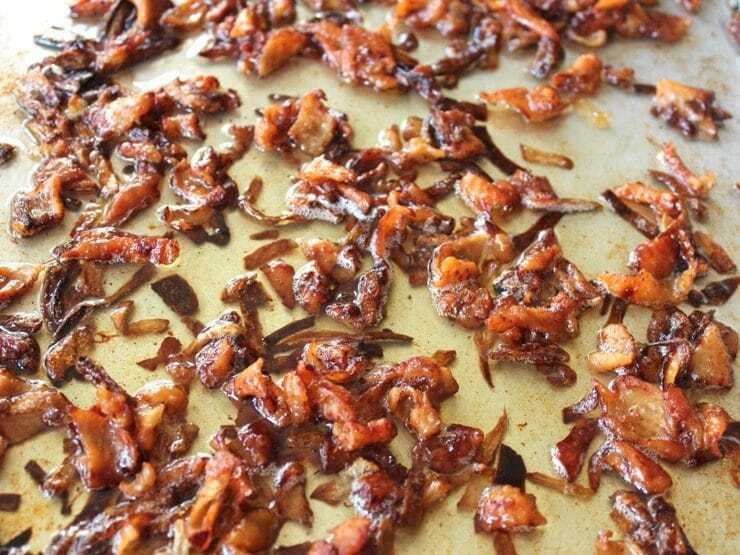 Sometimes referred to as “Jewish bacon,” gribenes are crispy, salty, sinfully delicious morsels, a byproduct of the fat rendering process. To the modern health-conscious cook, schmaltz and gribenes might sound like a heart attack waiting to happen. 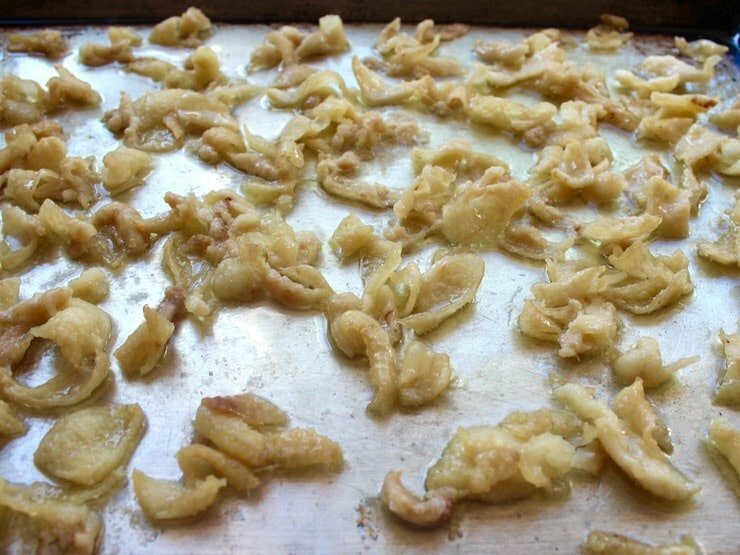 Schmaltz is a high cholesterol fat, but it adds a very unique flavor to dishes that is unmatched by any other type of oil. While many people find gribenes delicious, others might consider them too strange or unhealthy to enjoy. 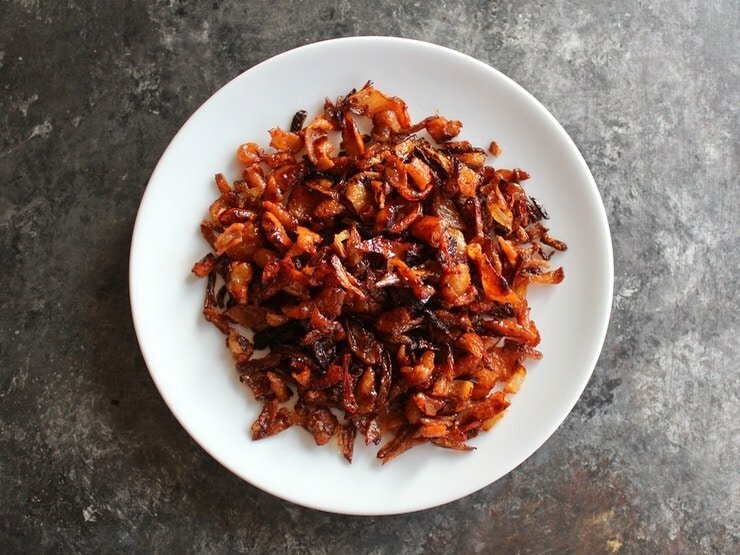 Take them or leave them, schmaltz and gribenes are quintessentially Jewish. 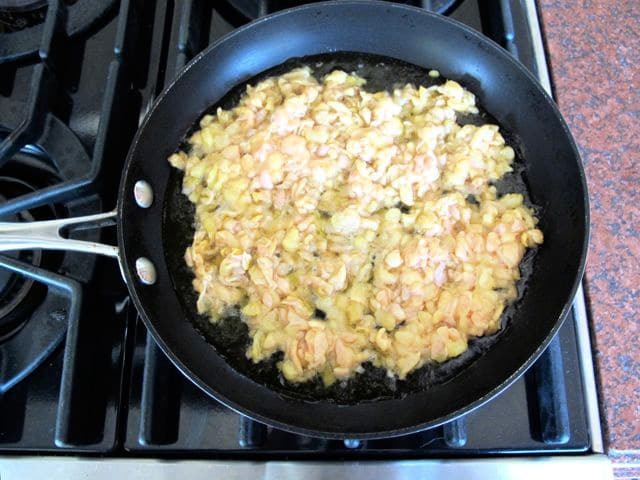 Schmaltz in particular adds an authentic flavor to many Ashkenazi Jewish recipes, including matzo balls and chopped liver. Though richly flavored, both schmaltz and gribenes were born of frugality. In Eastern European countries, chicken meat was an expensive treat. When a chicken was purchased from the butcher, every part of the bird was used. Schmaltz and gribenes are two creative ways of using parts of the chicken that might otherwise be thrown away. 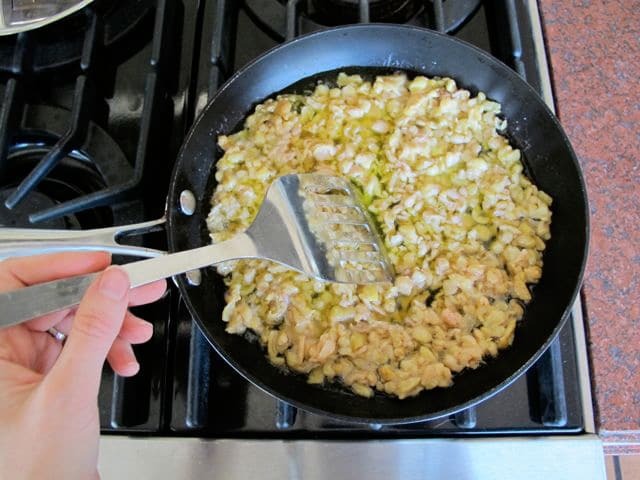 Schmaltz is collected by slowly sautéing chicken skin and fat, then collecting the liquid fat that melts as it cooks. 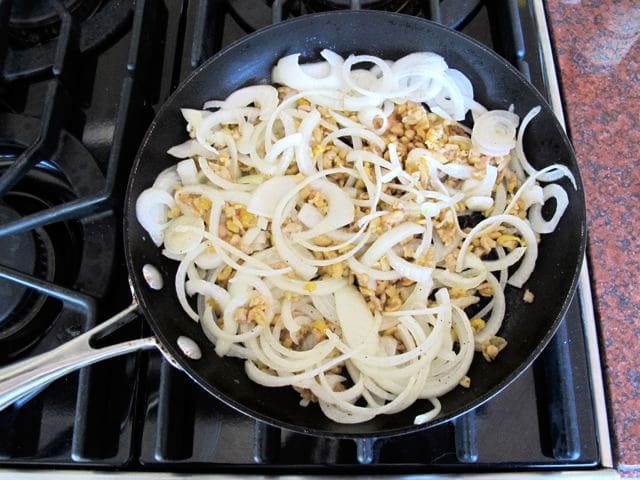 Most of the time onion is added to the mix, which flavors the schmaltz and makes the gribenes extra tasty. As the schmaltz collects, the chicken skin, fat, and onion to produce a batch of crispy little gribenes. They can be snacked on as-is or added as a condiment to other dishes. 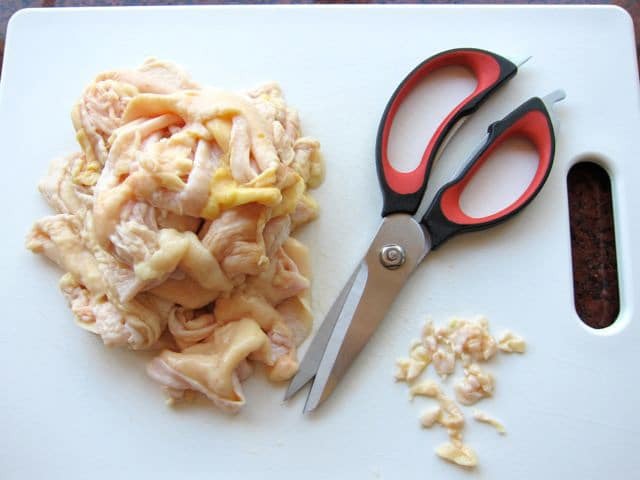 You might be wondering, “Where do I get a whole pound of chicken skin and fat?” Well, you can collect it from your everyday chicken recipes (store it in the freezer and thaw before using). You can try asking your butcher if they have any for sale. Or, you can buy a bunch of bone-in skin-on chicken thighs, which are the fattiest cut of the chicken. Remove the fat and skin, then reserve the thighs for another dish. As for rendering the fat, I have outlined two easy methods below. You can also collect schmaltz by cooling chicken soup in the refrigerator, then skimming the solid fat that rises to the top. If you’re a fan of schmaltz and gribenes, most likely you grew up on chopped liver. 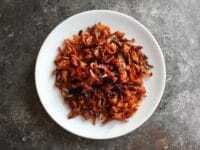 Check out my recipe here, which incorporates both schmaltz and gribenes in the mix. How to render chicken fat and make crispy gribenes cracklings, a classic ingredient in traditional Jewish cooking. You will also need: Nonstick skillet or baking sheet, mesh strainer, paper towels. Makes 3/4 cup schmaltz (liquid rendered chicken fat) and about 1 1/2 cups of crispy gribenes. Serving size is 1/2 tbsp schmaltz and roughly 1 1/4 tbsp gribenes. Note: 1 pound of chicken skin and fat can be obtained from about 15 pounds of bone-in, skin-on chicken thighs. 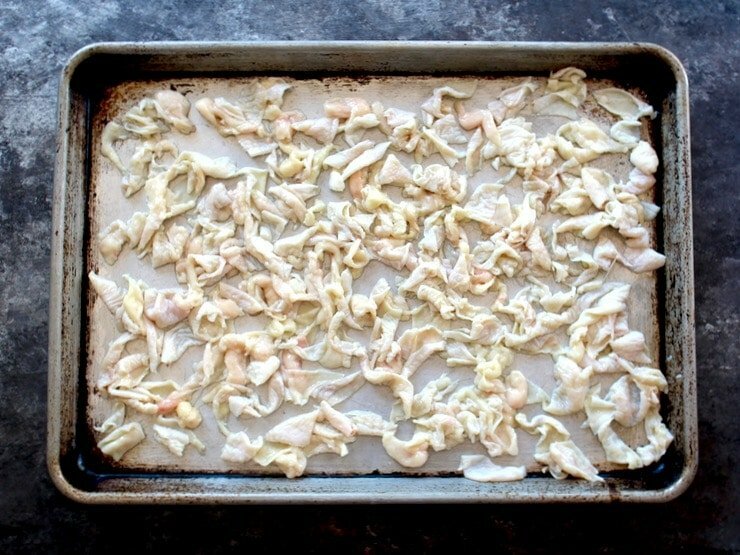 Or, save and freeze chicken skin instead of discarding it in various recipes, then make schmaltz when you have collected enough. While the 1 pound weight is a guideline for this recipe, you can easily adjust the ratio above for less or more chicken skin as needed. Rinse the pound of chicken skin and fat, pat dry, then chop it into small 1/2 inch pieces. Toss the chicken skin pieces with 1 tsp kosher salt and 1/4 tsp black pepper. Place the skin and fat into a skillet on the stovetop (make sure it's cast iron or nonstick!) and turn heat to medium low. Cover the skillet and let it cook on medium low for about 15 minutes. Liquid fat will start to pool at the bottom of the skillet. Uncover the skillet and raise heat to medium. 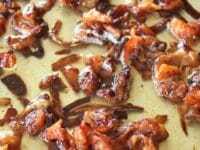 At this point you can add onion, which will give you an onion-flavored darker colored schmaltz, or you can render the fat without onion for a cleaner, purer fat with no onion essence. Most Jewish cooks prefer to render the fat with onion. Let the skin and fat cook for another 15-20 minutes, breaking the pieces apart with a spatula and stirring frequently, until the skin starts to brown and curl at the edges. At this point there should be quite a bit of liquid fat at the bottom of the pan—this liquid is your schmaltz. Remove pan from heat. 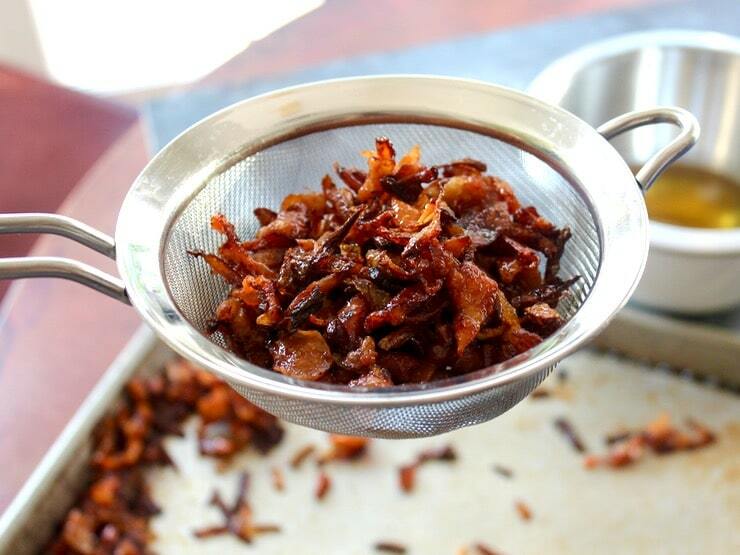 Pour the schmaltz from the skillet into a container, using a mesh strainer to catch any small pieces of skin. 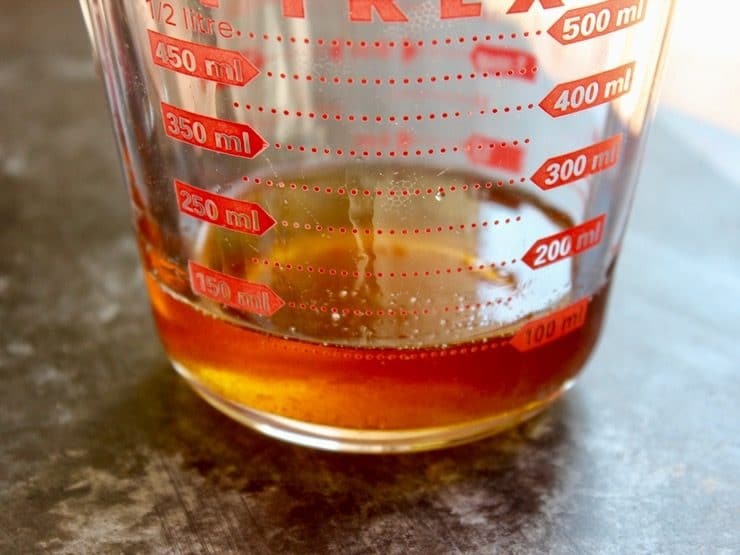 A golden oil will result—this is called schmaltz. It can be used in a variety of Jewish dishes or as a cooking fat. If you cooked the onions as the fat rendered, your oil will be a darker golden color with an orange hue. The schmaltz will stay liquid at room temperature; it will become solid and opaque if you refrigerate it. 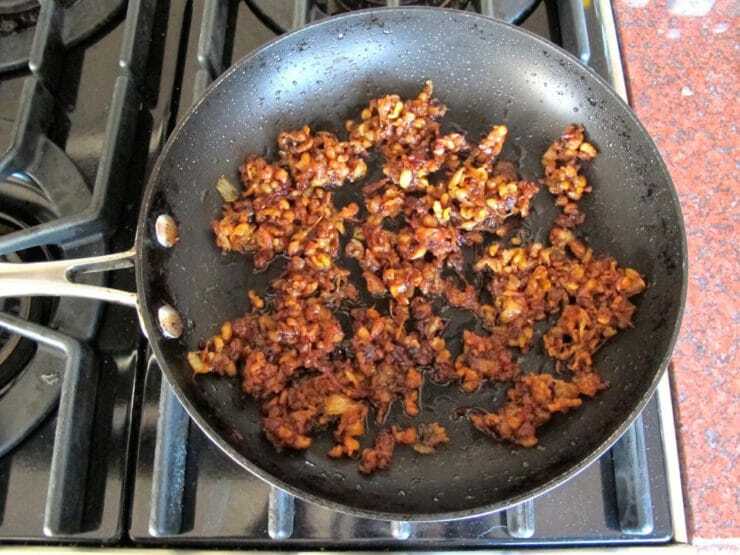 If you cooked the skin and onion together, return to medium heat and continue cooking in the skillet until the skin is deeply golden, curled and crispy, and the onions are dark brown. Drain on a paper towel and serve. If you did not cook the onions with the skin, you can cook them after the schmaltz is collected. Return the cooked chicken skin and fat to the skillet. Turn heat to medium and sauté the mixture for about 20 minutes, stirring frequently. Don’t leave them alone for long or they’ll burn! Adjust heat lower as needed to keep from blackening too much. When pieces are dark brown and crispy, remove the gribenes from the skillet with a slotted spoon and drain them on a paper towel. They become crispier as they cool. 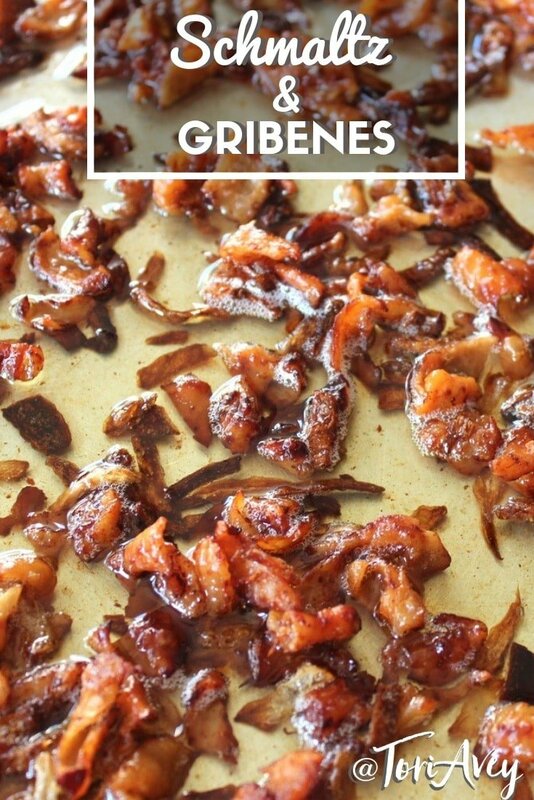 Gribenes can be snacked on as-is or added to other dishes as a topping. 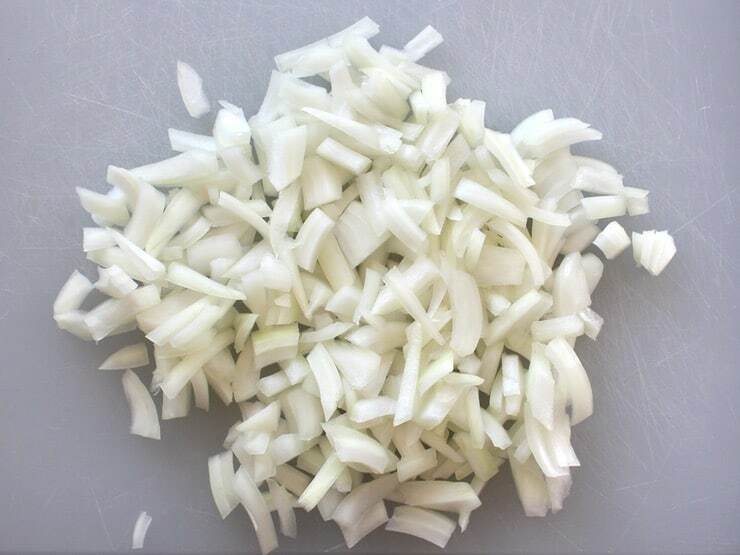 Cut your onions into slices, then cut slices into pieces around 1/4 inch long. Preheat oven to 350 degrees F. Toss the chicken skin and fat with 1 tsp kosher salt and 1/4 tsp black pepper, then spread it out into a single layer on an ungreased baking sheet. Place baking sheet in the oven and let it roast for 20 minutes, until the skin starts to turn golden and curl at the edges. Fat will have started collecting on the sheet. 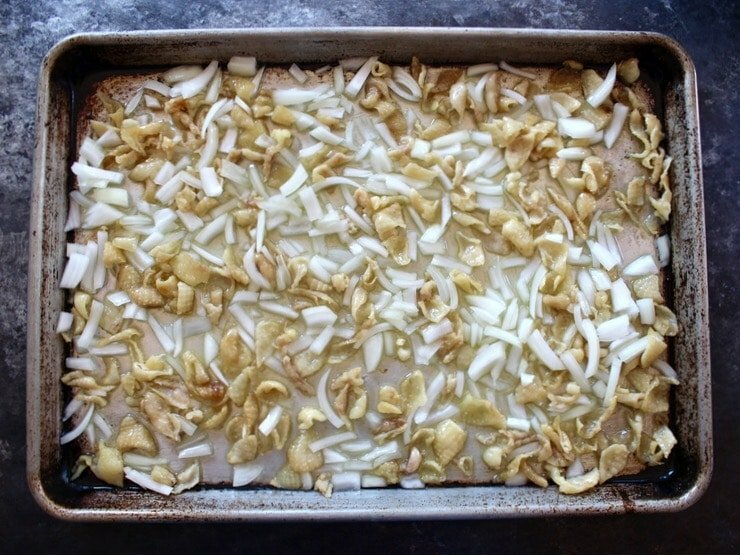 Add onions to the hot baking sheet, spreading them out evenly throughout the chicken skin. Return to oven and continue roasting for another 40-50 minutes until the skin is golden brown and crispy and the onions are dark brown. When stirring, make sure to move the pieces on the outside towards the center, and move the center pieces out towards the middle, so the pieces evenly brown. When the pieces become crispy, remove from the oven and let the tray cool down. 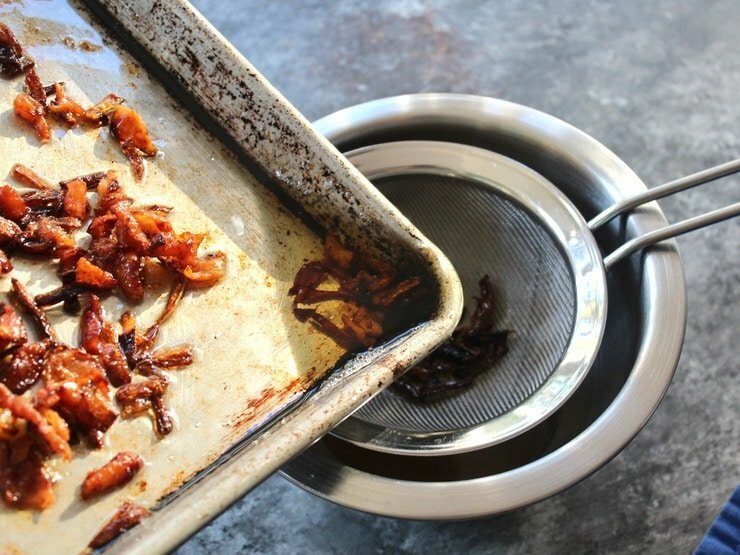 Strain the fat from the tray through a mesh strainer into a collection container. The gribenes are delicious to snack on or used as a topping. 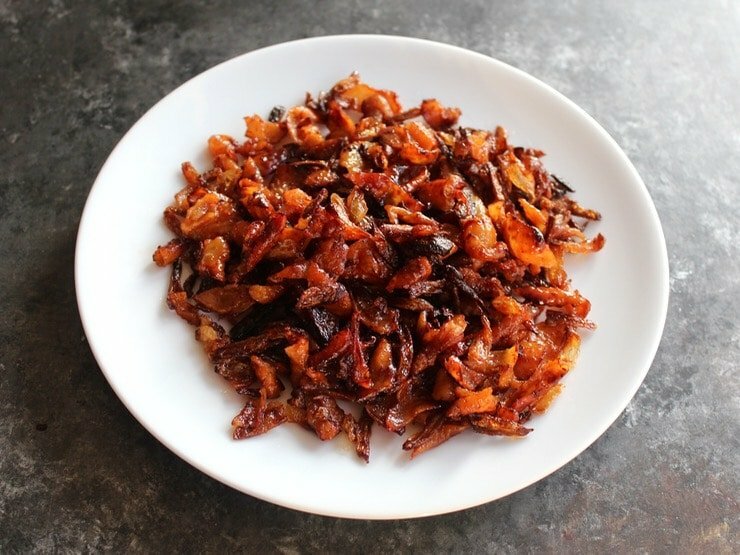 The schmaltz should be saved and used in a variety of savory dishes. In will keep for several weeks in the refrigerator. Can I use duck fat? Delicious recipe! I grew up in a predominantly Jewish neighborhood, and loved chopped liver. This recipe reminds me, both in taste and aroma, of the wonderful food my friends’ mothers and grandmothers prepared. Our city boasted a large Arabic and Jewish population, and we all grew up in the same area of town. It wasn’t uncommon for us to share meals with one another, so it might be kibbee and grape leaves one night, and brisket or delicious roast chicken with all the trimmings, the next. The richness of our traditions holds to this very day. I’m looking forward to your newsletter and more nostalgic recipes. Q about what is rendered fat: Recently, I’ve been using the pressure cooker function of an Instant Pot to make chicken broth. I primarily use thighs — maybe 4-5 pounds. I cut the bones and add about 3 quarts of water, pressure cook for two hours. After straining the broth, I chill it and normally after overnight, there is maybe 1/8th of an inch of fat at the top. It is slightly hardened. Is that rendered fat? I see schmaltz used quite a bit in your recipes and I am wondering if one could buy schmaltz already made? I would love to make my own but really don’t get a chance to spend much time cooking anything from scratch right now. Hi Maureen! Most kosher markets offer small frozen tubs of schmaltz in the freezer section. Thank you I am a goy that enjoyed chopped liver at a Jewish wedding. After 25 years or more I will make it tomorrow and enjoy it like nothing else since I love liver anyways.. Thanks for the recipe. I love that so many delicious foods are also frugal. 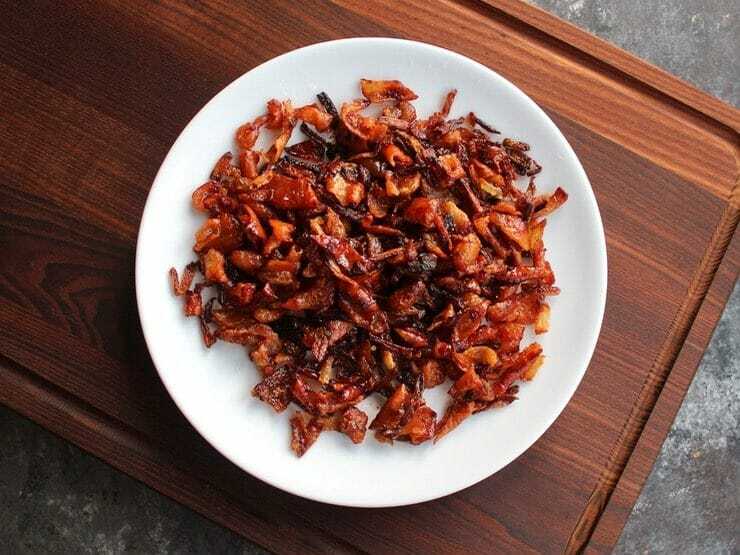 Those crispy bits would last about 3 seconds in my house, but if I managed to save a bit, how would you suggest I use them? very interesting article. can you also use the skin from a turkey to make a similar ingredient? there is always more skin on turkey, but perhaps the flavor would be too different? Suzi, I think the turkey skin might work, but I have never tried it myself. Worth experimenting with it! What is the best way to store gribenes and how long can they be stored? Also, how long will the schmaltz stay good? Hi Shannon, Tori’s assistant Ashley here. You can store the gribenes in an airtight container for up to 3 days and you can keep the schmaltz in the refrigerator for a week. The schmaltz can also be frozen. with more love than I did? She agreed as bubbe’s ALWAYS cook with love, but also told me she fried them in schmaltz! Well…I tried them with the recipe above, and it was TRULY like bubbe had come alive in my kitchen. Oh my goodness!! and praising me Yiddish, and then telling me to get out of the kitchen!! ????❤???? Try spreading a little schmaltz on rye bread and sprinkling with some paprika. I have been making Matzo Ball soup forever and always prefer my soup from scratch; boiled chicken, boiled bones & veges, etc. I love my Schmaltz, it is my favorite kitchen create. After I make my chicken soup from scratch, I recover lots of flavorful schmaltz from the top of my jars and save to smaller jars and wondered today how long it would last beyond my smell test. Not exactly sure, but I do know you should freeze it to ensure food safety and greatly extend shelf life. 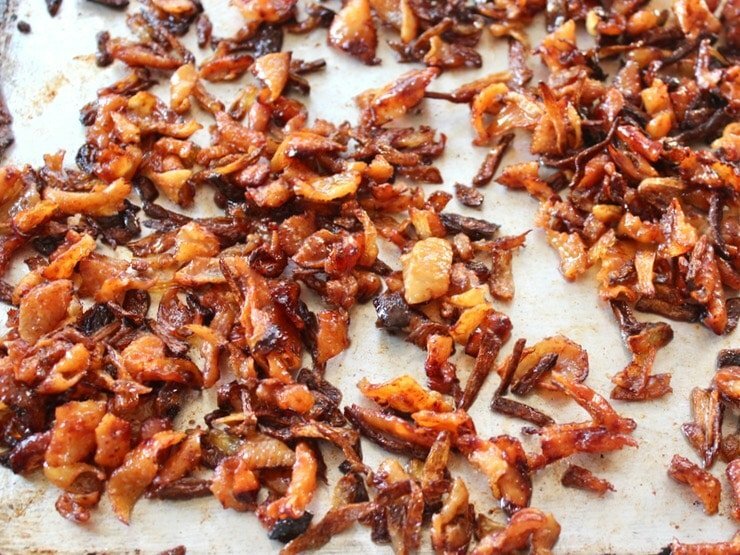 I have always liked fried chicken skins, and yes its a lot like bacon!!! Now, I do not use nonstick because of the chemicals used in them that have been known to cause cancer. I use stainless steel or my well seasoned cast iron which is naturally non-stick.